Salam & hello everyone! Did you know that your skin also needs their "moisturizer". I do admit that I do sometime neglect my body but not my face, which is a bad thing. Why this happen is because I hate the sticky feeling lotion usually gave me. But not this time, I have an awesome range of body lotion and serums to share with you people! You should care for your skin as much as you care for your face. This is what I really need to keep in mind. After discovering ENCHANTEUR Paris Body Lotion & Serum range I am by far so happy! 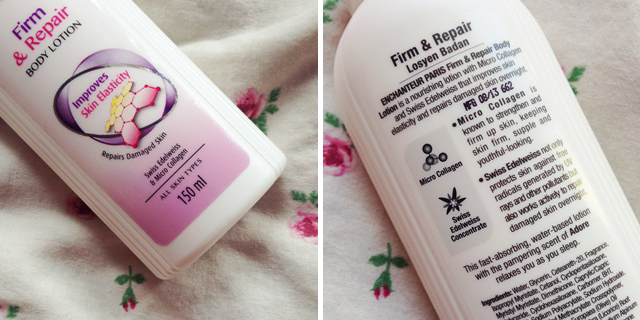 This is one of the best lotions I ever tried and what is the best part of it? It does not leave sticky feel at all and it absorb fast! Everything is a water based lotion & serum. Looking at how we need to face our hot humid weather, with a hectic city lifestyle it is a must that we need to protect and ensure enough benefits to our skin so we can get good smooth *muah muah* skin! Now I can't stop sniffing my skin because it smells so good! I was raised with ENCHANTEUR, when I was a kid my grandma will always use ENCHANTEUR Talc to get me ready so I smell good! It was her favorite thing to stock up every month for me and for my cousins. Hehe. I love the smell so much! ENCHANTEUR always have the best range of scent and care. Just like the Body Lotion & Serum that is newly launch under its sub brand ENCHANTEUR Paris, you can have 4 options to try on! Each lotion and serum have been caters to suits all women skin needs. Choose what suits your skin or choose your favorite scent! Or just everything! They are retails at a very amazingly awesome price too! Here is a swatch for all 4 lotions and serum. As you can see the first from the left is the All in One Serum and continues to all ENCHANTEUR Paris Body Lotion. The star product to this range is the new All in One Body Serum that has all the best benefits all women must have! The textures of these lotions are very light and easily spread on your skin. It absorbs fast and does not feel heavy on the skin. Below I will explain and review each lotions and serum! As I mention in my previous post so many time that sun damage and sun rays are very dangerous. Especially in our humid hot weather, our skin can get burn easily and damaged. Exposure to harmful rays can cause a lot of negative effects to skin such as skin darkening, uneven skin tone and the baddest part is, it will lose its moisture. This can cause skin aging fast. No we don't want that right. Did you ever hear that our body can also have a serum? Well not only your face deserve a serum! Now you can have a full concentrate serum for your body that can give you sun protection, hydration and whitening! 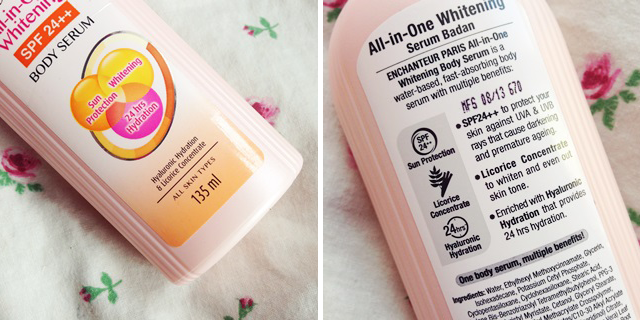 All in one and all the things I want for my dry skin! It’s a multi-benefit serum that is perfect for you who is on the go, love body cares that absorb fast and smell so good! The scent is mild and not overpowering. Just perfect! I love this serum because it contains sun protection of SPF24++ that protects your skin from both UVA & UVB rays. The Licorice concentrate that contains in this serum helps to lighten your skin and this serum also contains Hyluronic Hydration which gives 24hr hydration!!! In short, it’ll keep my skin supple and moisturize! All you can have in one bottle! Ingredient Highlights : Sun Protection SPF 24++, Licorice Concentrate, Hyaluronic Hydration. Did you realize that some parts of your body for example your knees, elbows and the back of your neck is a lil darker than the rest of the part of your body? Well I have that! Thanks to this, now I can make them lighter! I always want my whole body to be as light as where I find my skin is, the one that is not exposed to the sun. Sun damage can really makes your skin darken. Which I hate. ENCHANTEUR Paris came out with this lotion to help my problem go away. 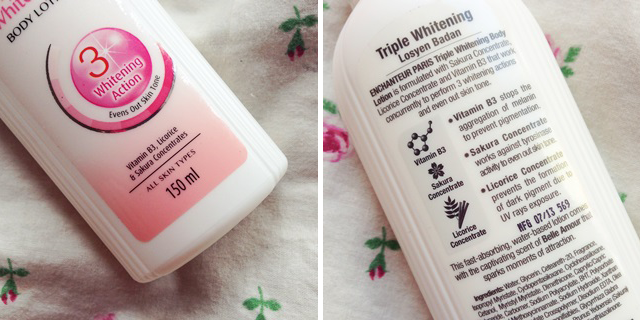 This lotion contains three effective Whitening ingredients that help to lighten your skin which is the Vitamin B3, Sakura Concentrate and Licorice Concentrate. Vitamin B3 helps to stop melanin production that causes pigmentation. Pigmentation is the dark parts of your skin. The Sakura concentrate helps to even out your skin tone and the Licorice Concentrate helps to prevent dark pigmentation forms causes by the UV rays. 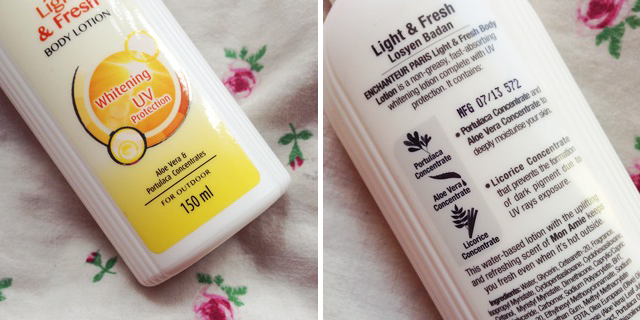 If you want to find a lotion that helps to lighten your skin. Go for this! One of the things I wanna do this year is to be more active outdoors. Thinking about the sun damage sometimes makes me sit back to my couch and watch tv. Now I can have a protection as well as whitening benefits to my skin when I wanna go for an outdoor activities. I love how the new ENCHANTEUR Paris Light & Fresh gives my skin feels fresh and protected. If you love the smell of after shower, you love this. It also contains awesome ingredient such as Portulaca Concentrate, Aloe Vera Concentrate, and Licorice Concentrate that helps to protect and helps lighten your skin. Its smells lemony fresh! I love this one too. Ingredient Highlights : Portulaca Concentrate, Aloe Vera Concentrate, Licorice Concentrate. Sponsored Post. This product(s) were send to me for product review purposes. Have you tried ENCHANTEUR products? Which is your favorite! Oh, we also have this brand in Thailand but it sells only fragrance line. There are 4 body lotions in 4 different smell. I grew up with Enchanteur too! My parents love their talc with yellow rose on the label, I love the pink and purple rose label talc when I was in the hostel, and now my only favourite perfume is Enchanteur Belle Amour (pink box). I have 3 sisters and all of them uses Enchanteur lotion, perfume and body spray. Enchanteur loving family here, hehe! now im loving the firm care (purple) one! really? haha! i really love it. i love using it after shower. It does not feel sticky at all and easy to blend in. Hi dear, i dont sell this online. you can get this at local malaysia pharmacies. boleh tak kalo body serum tu nak letak dkt muka jgak ?